The 2012 Milwaukee mayoral election was held on Tuesday, April 3, 2012, to elect the mayor for Milwaukee. Incumbent mayor Tom Barrett was elected to a third term, defeating Edward McDonald. 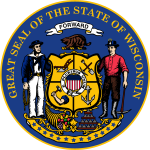 This election coincided with other municipal elections, including an unopposed re-election bid for Milwaukee County Executive Chris Abele and contested elections for City Comptroller, City Treasurer, and the Common Council. Municipal elections in Wisconsin are non-partisan. The non-partisan primary was held on Tuesday, February 21, 2012, to narrow the field of candidates to two. Barrett announced on March 30, 2012 that he will run in the Democratic primary for Governor in the recall election to face incumbent Scott Walker and subsequently lost. ^ "Tom Barrett re-elected as Milwaukee mayor". Wisconsin State Journal. Associated Press. April 3, 2012. Retrieved April 29, 2012. ^ a b c d e f Schultze, Steve; Sandler, Larry (January 3, 2012). "Abele, Barrett see little opposition in spring races". Milwaukee Journal Sentinel. Retrieved April 29, 2012. ^ Sandler, Larry (January 31, 2012). "1 of Ald. Coggs' opponents kept off ballot". Milwaukee Journal Sentinel. Retrieved April 29, 2012. ^ "Spring Primary Election City of Milwaukee". City of Milwaukee. February 22, 2012. Retrieved April 29, 2012. ^ "Presidential Preference Election City of Milwaukee". City of Milwaukee. April 3, 2012. Retrieved April 29, 2012. ^ Bice, Daniel; Sandler, Larry; Marley, Patrick (March 30, 2012). "Barrett will run in recall election". Milwaukee Journal Sentinel. Retrieved April 29, 2012.